It’s no secret that we LOVE to simplify meals around here while preserving the flavors. Believe it or not, this insanely delicious copycat Sizzle Pie Rabbits salad is already simple but will impress you with its flavor. Sizzle Pie is a hipster pizza place with only three locations on the West Coast and one on the East. I’ve been to the one in Portland, OR. They share their garage-like venue with another joint that has awesome biscuits and gravy stuffed with fried chicken and bacon. You have surely seen the photo of it on my Facebook page. The place looks retro artsy, it’s vegan-friendly and their pizza is super greasy, but this ‘rabbits’ salad is to die for. Portland is too hipster for my taste (or is it that I’m too old) but they sure have great food. Like that amazing flatbread pizza that I rave about. Salads have come a long way since I was a kid. Depending on the season, they either consisted of green leaf lettuce like this Boston lettuce with beef and eggs, fresh tomatoes, peppers, and cucumbers from the garden or pickled. We never served them before the meal or alone as an entree, but always along the main dish. 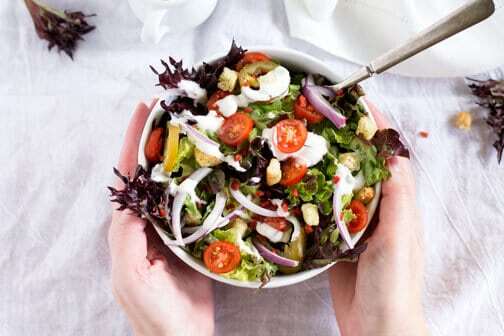 Nowadays, the list of ingredients in a salad includes everything but the kitchen sink and sometimes the sink too. That’s not necessarily a bad thing, but you can rarely find a simple salad that is not going to get you full before the dinner is ever even served. But this salad is different. Don’t let the simplicity of ingredients fool you. The combination is surprisingly supreme. Sizzle Pie offers vegan and nonvegan option. I opted for vegan just because (although I’m a carnivore) and I loved it. Get ready to love it too! Make hot peppers less spicy by removing the seeds and rinsing under water. Use real bacon bits and regular ranch dressing for nonvegan version. Tear the lettuce leaves into bite-sized pieces and transfer them to a large salad bowl. Add the onions, tomatoes, hot peppers, bacon bits, and croutons. Ah well, I do love a good salad AS a meal, so long as I add some cheese or protein (like maybe, rabbit), so no doubt I will substitute REAL BACON CHUNKS (vegan is like a cuss word to Mr Shoes) and enjoy a good plate of roughage. Me neither before I discovered them in Portland. They only have 5 locations, maybe that’s why. I’ve never heard of Sizzle Pie but it sure looks delicious and so healthy. You can’t beat that combination. Red leaf lettuce is my favorite and this looks like a great combination. Definitely pinning to try it out! Sizzle Pie Rabbit Salad, now that’s a first. It looks delicious. I’m going to add this one to my Pinterest Salad Board. Thanks for sharing on Sunday’s Best. Ha, ha… They’re not so global, yet 😉 Thanks, Rhonda! 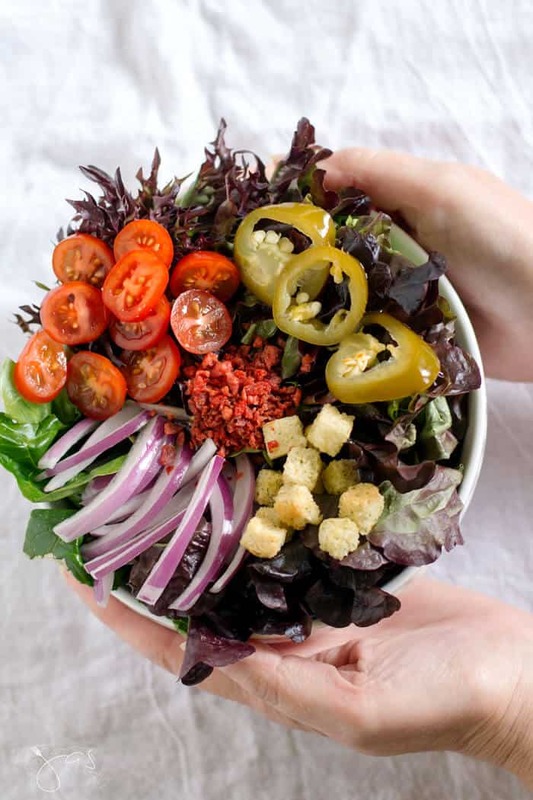 It looks like a great salad – really fresh and tasty! I am still trying to eat lots of salads to stay healthy through the winter. That’s the key, Corina. It helps when you find one you really like and it doesn’t need lots of ingredients so it’s a quick fix, like this one. Looks delicious! I have never heard of this restaurant, but I love the fun name! Thanks for sharing the recipe with SYC. 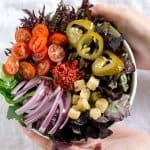 Sizzle Pie is a new name to me, but the salad looks amazing! Thanks for sharing it this week on the Encouraging Hearts & Home Blog Hop. Have a great weekend! Stopping by from the Sugar & Spice Recipe link up. This looks great, and I’m definitely pinning it! This looks so good. I used to be great about eating salads regularly, but fell off the bandwagon. This looks like a great place to start again. Thanks so much for sharing at the #happynowlinkup! Jas I must admit I was a bit worried by the ‘rabbit’ salad but thankful to find this was actually full of gorgeous vegan ingredients. It looks very appetising and something I would eat regularly. Thanks for sharing at Fiesta Friday – don’t forget to share the links so others can join the party too! Deceiving, I know, ha! It’s a salad for rabbits not with rabbits, LOL. Have a great weekend, Laurena! Ha, ha, Amber! Bunnies were spared. 😀 Thanks for stopping in! Gee, I don’t see anything in that salad that I don’t like except maybe the hot peppers, but I can leave those out, right? 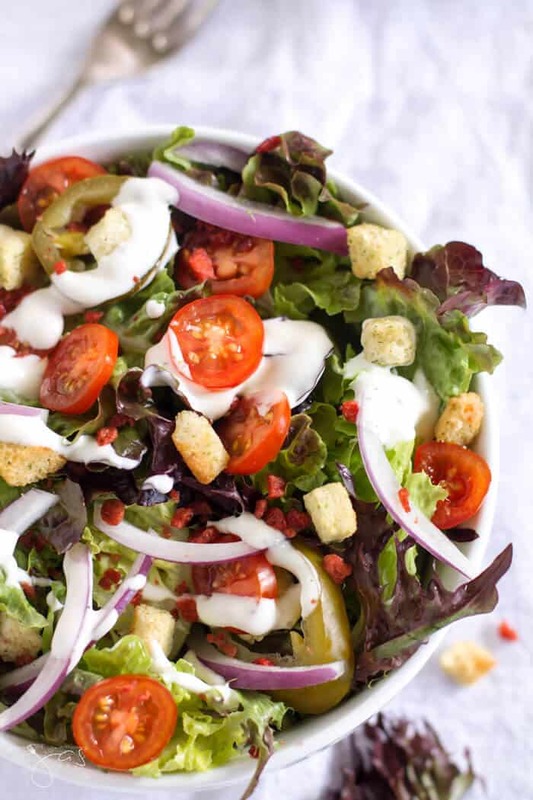 Otherwise, love the fresh flavors of salad, so this looks great Jas. Definitely! The flavor won’t change, they only give a little kick to the salad. I don’t always use them either. This looks good! Thanks so much for linking at To Grandma’s House We Go link party! Your project has been pinned. We hope to see you again this Wednesday! I have never heard of this salad before. Looks so yummy though! Thanks for linking up at Friday Frenzy Link Party! Pinned! !